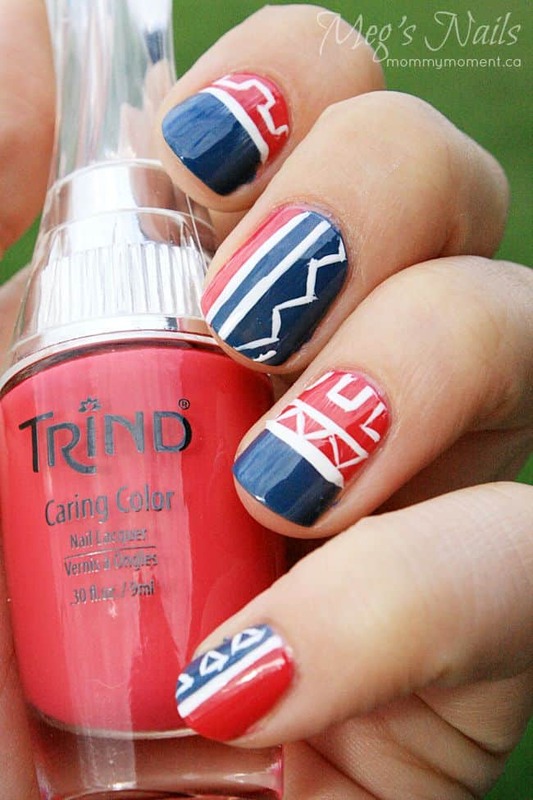 Trind is a brand known for it’s hand and nail care. They are especially known in Europe but have recently started climbing the status poles here in North America too. 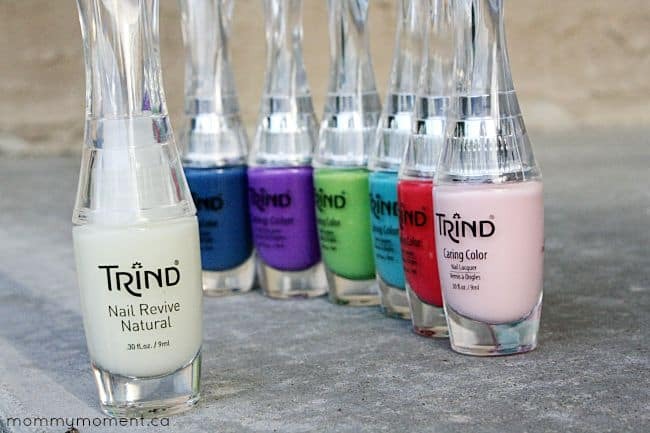 Trind was founded in 1988 and their goal is to provide nail care products that make your nails stronger and healthier. This last week we got to try out a few of their products for the first time and have some pictures to help you learn about this brand too. Trind North America sent six bottles of colour along with one nail strengthener. To do a little research I went to the Trind North America website, and wow, they have a very nicely set up website! If you click under FAQ’s, you will find solutions and answers to all your nail questions. I appreciate how Trind really cares about the health of your hands and nails. They don’t just make the cheapest product, but they make a product that you can feel good about wearing. If you want to try out this product we can help you on your way with a chance to win a few bottles from them! 1 Mommy Moment reader will WIN a Trind product bundle valued at over $100, including a bottle of the Trind Nail Revive and a black patent-look cosmetic bag, as well as a Summer Color Wardrobe of 6 Trind Caring Color Polishes. To enter, sign up for the Trind North America Newsletter. Nail designs in this post were created by Megan. Megan loves trying new designs out on her nails and sharing them with people around her. I would paint my nails purple or green!! I would paint with purple first. I would pick the light pink nail polish – thank you! I (aka my daughter) would paint with the Dark Frosted Pink first. I like the color Applelini bright green color. Love bright colors. I would use that pretty aqua color in the top pic,,so pretty! I love the turquoise colour and would try it first. That’s a hard choice the colours are so beautiful! I think I would do multi colours! I would go with the pink first. I would love to try the appletini color! but on their website I’d like to try the sienna. Would paint on the blue colour first! They are all pretty colors but I would try the purple first. Hmm, a difficult choice to have to make but probably the Pastel Pink first. I would use the purple colour first! I would also paint with purple first. I would paint my nails with the purple. I would paint with the blue first. All gorgeous colors! I would paint with the Metallic Magenta first. The blue would be my first choice. The green above is really cool – thanks! The Pastel Purple would be my first choice to wear..
Purple would be my pick! I love mauve so the purple would be first. It’s getting to be the fall, so I always like to go with red in the fall and winter. I also always get a flower done on each big toe. It’s the only time I pamper myself. I would definitely use the purple first. Great colour! I would definitely try the pink first…so pretty. Oh I really love the purple!! Beautiful colors! I would paint first with the red. I would try purple first because I just used the last of mine! I would paint my nails purple I love that color! Probably the Turquoise followed by red then white in some SW pattern. Apple green or apple for sure. I would first paint my nails with the dark blue color but they all are gorgeous! I used the light pink first!